Well, it's been a couple of days since I shared a card with you, so today I'm back in "card" mode. I actually made a couple of cards yesterday, and both were challenges. I decided that would be a great way to keep my card creating momentum going, so I participated in both the Inspiration Challenge on Splitcoaststampers (that card I'll share later), and Ilina's sketch challege on the Hanna Stamps forum. Both challenges were great, and got me into the stamping room and out of a bit of laundry! I am now a staunch advocate for challenges!!! Can you believe this is the first time my Kiss the Cook Hanna has been inked? My creative mojo was preoccupied somewhere in the land of Christmas cards and projects, and as a result, my new Hannas (purchased last Fall), got lost in the shuffle. In keeping with my goal for the new year to use my uninked or neglected stamps, I got her out, inked her up, and had a ball creating this card! I've decided that challenges are the way to go! The hardest thing for me is deciding where to begin, but if I have that starting point, then I can actually picture where I want to go with it, and everything seems to fall into place from there. Yep, I think I'll be participating in lots more challenges. There so many out there, so my challenge to you is...Check out the challenges! 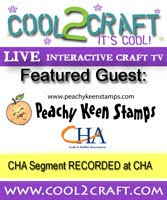 Check 'em out, get to stampin', and let all those stampers out there who take the time to come up with those challenges know that you appreciate their efforts! If you're a football fan, then Happy Superbowl Sunday to you! Sorry, but I'm not much of a football fan. I pretty much just tune in for the commercials and the halftime show. It sounds like a good time to be lost in the depths of my stamp room, which is most likely EXACTLY where I'll be!! Thanks for stopping by, and have a blessed and beautiful day! Lorie, you have really mastered watercoloring. This is divine. The layout it divine as well. Great card! What a jaw dropper!!!! I love your watercoloring, and I swoon over the color red:o) Such a beautiful card!!! Your talents never cease to amaze me!! I always leave with a burst of creative inspiration:o) Thank you!! !